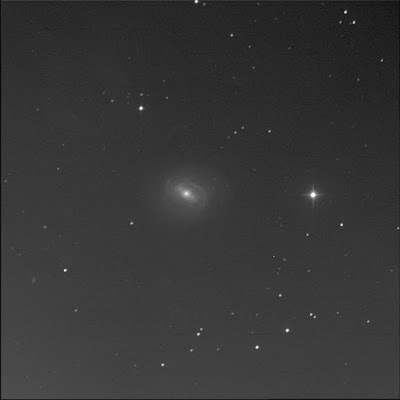 The Burke-Gaffney Observatory imaged Messier 58 for me. I wanted to revisit this galaxy also known as NGC 4579 in the constellation Virgo. From 4 July '10, I only had one log entry for M58. This is a fantastic barred spiral galaxy. It looks to be face on or nearly so. Love the detail in the grand arms twisting away from the prominent bar. The core is bright but compact. Beautiful. To the south-east, a good distance away, is the tiny fuzzy oval of LEDA 1397945. Near the gaggle of stars to the north-east, on the eastern edge, is a very small fuzzy oblong shape. SkyTools 3 Pro says this is LEDA 1400836.